Orgone is the name that Wilhelm Reich gave to the energy that moves us. Reich believed that where there is emotional repression there is a concomitant protoplasmic contraction in the body. Because this physical tension tends to become chronic with time, binds energy, and constricts the free pulsation of our bodies, it is truly an armor that imprisons us for life. If we are all so armored – and we are, according to the author – then the history of humanity has been the history of an emotionally and physically crippled animal. Our revolutions and our religions cannot liberate us because after we have struggled to free ourselves we still find ourselves within the cocoon that we continuously weave. Psychiatry explores the immense and fascinating complexity of how we function – a journey we need to continue. But the key to a person’s deep understanding of the point of deviation from one’s nature may lie with psychiatric orgone therapy. Though it is not a cure-all or appropriate for all patients, psychiatric orgone therapy can effect significant changes in emotional disorder and open lives. Emotional Armoring was written to disseminate this knowledge. The author, a pupil of Reich’s, presents the fundamentals of orgone therapy. He shows how, through armoring, innocent impulses become cockeyed impulses, and eyes that linger and look deeply, as a young child’s, turn into eyes that look sidelong and turn away. Over time, our bodies lose their ease and grace and become stiff, dyspeptic, and constipated; armoring disfigures us literally and spiritually. 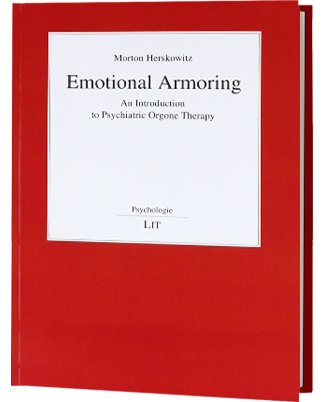 The author uses case studies and clearly wrought, unpretentious explanations of how an understanding of armoring, the nexus between biology and psychology, can be used to evaluate human events and see man in relation to his universe. We can relieve 70 percent of depressions with antidepressant drugs; neuroleptics can ameliorate the hallucinations and delusions of psychotic patients; and we can pinpoint the metabolic deficit in a specific area of the brain to mark a particular psychiatric syndrome.